More than 200 McDonald’s Malaysia office staff, franchisees, and business partners ‘turun padang’ today and worked alongside restaurant crew members to serve customers in an effort to get involved and to understand what it takes to deliver McDonald’s “feel-good moments”. Key business partners who also got on ground included Datuk Kamal bin Khalid, Group Managing Director of Media Prima Berhad and Datuk Ahmad Izham Omar, Chief Executive Officer of Primeworks Studios. “I am extremely thrilled to join the McFamily today in preparing McDonald’s world-famous menu. This is a brand that has consistently pushed the boundaries to provide high quality and delicious food to its customers, all served with a smile,” said Datuk Kamal. “Working alongside the crew today was an eye-opener to what goes on behind-the-scenes at McDonald’s restaurants. McDonald’s cares for its employees as much as its customers. The company is a household name known to always put its people first, and is a great place to build one’s career,” said Datuk Izham. Recently, McDonald’s was accorded The Best Employer in Malaysia 2018 by AON, The Best Companies to Work for in Asia 2018 (Malaysia Edition) by HR Asia, and the Best Franchise Employer 2018 by Malaysia Franchise Awards. The achievements are testament to McDonald’s Employee Value Proposition (EVP) – Family & Friends, where the company treats their People as more than just co-workers, but more as extended family members and friends. McDonald’s also provides Flexibility as they believe that every person’s personal requirements are different and lastly, it promises a bright Future for its People by equipping them with lifelong career and personal skills. “McD Turun Padang Day is an annual occasion to celebrate and give recognition to our 12,000 strong restaurant crew here in Malaysia. 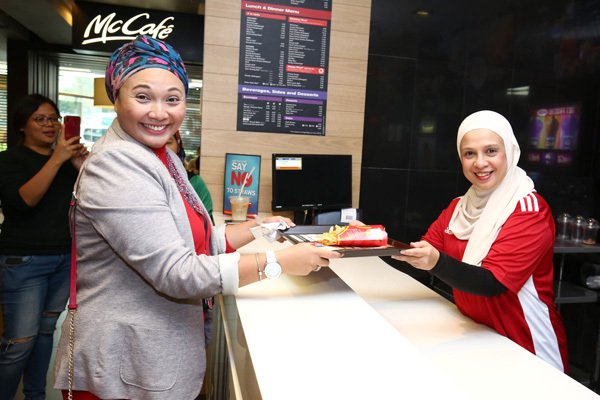 Their undivided commitment to the brand has brought on the sustained success that we are seeing today and which continues to put a shine on the Golden Arches,” said Managing Director and Local Operating Partner of McDonald’s Malaysia, Azmir Jaafar. According to Azmir, McDonald’s Malaysia has invested more than RM8 million annually to drive human capital development initiatives, in line with the company’s goal to build sustainable career paths for its employees. McDonald’s key initiatives in empowering its people help the company attract, retain, and develop its talents – critical elements in achieving the organisation’s growth target of 500 restaurants by 2020 in Malaysia.